Since its invention in 1924 in Tijuana, the Caesar salad has suffered countless transgressions, not least the ubiquitous chicken-breast add-on. As it turns out, though, the original recipe, improvised by Italian-immigrant restaurateur Caesar Cardini, is less of a strict formula than a highly interpretable guideline. Contrary to conventional wisdom, Cardini coddled his eggs and eschewed anchovies (a flavor he credited to the Worcestershire sauce in his dressing), rendering the revered tableside ritual of raw eggs and mashed fish a bit of theatrical fabrication. But that’s nothing compared to some of New York’s newest Caesar riffs. Romaine has been swapped for more exotic greenery like escarole (at The John Dory Oyster Bar) and kale (at The Bedford, where the anchovy dressing is seasoned with Sriracha and sumac; at Five Leaves, where chef Kenny Addington enhances his with Thai chiles and aged Gouda; and at the East Village’s Counter, where the vegan version wears tempeh croutons). 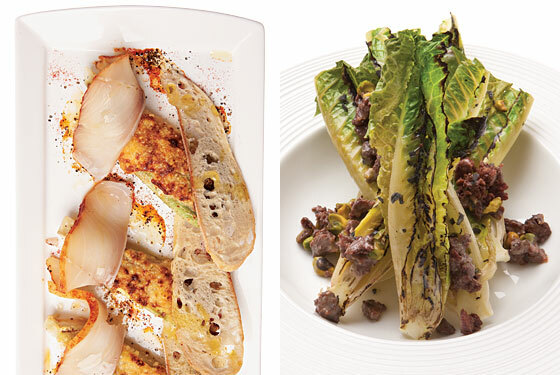 At Millesime, chef de cuisine Alan Ashkinaze fills grilled hearts of romaine with Parmesan, browns them under the broiler, and plates them with slices of Petrossian smoked sable. Speaking of unorthodox fish, pickled herring displaces anchovy entirely in two stellar new salads: Vandaag’s Phillip Kirschen-Clark softens its tangy bite by blending Russ & Daughters’ creamed pickled herring with more cream, vinegar, and olive oil to dress romaine hearts, then garnishes them with morcilla sausage and pistachios. And at Long Island City’s M. Wells, Hugue Dufour soaks smoked herring in red-wine vinegar and blends it with Worcestershire, Parmesan, and poached garlic before emulsifying it with olive oil and Dijon mustard. At Ciano, Shea Gallante goes so far as to dress baby romaine with a tonnato sauce and adorn it with not only anchovy and Parmesan, but Bartlett pears—a brave, some might say blasphemous approach to a not-so-classic classic.